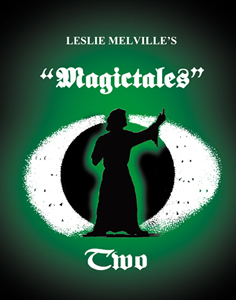 Details Of Magictales Two by Leslie Melville, published in 2012..
Six years following the publication of his innovative first book – 'Magictales' – the Definitive Book of Storytelling Magic! - Leslie has created a second volume of even more exciting material. Simple to perform magical effects set within the context of interesting and entertaining plot lines. Those who purchased the first book will be delighted to know that there are two additional presentations based on his highly praised 'Kismet' principle – one of them reconstructing a séance in which the identity of the notorious 'Jack the Ripper' is revealed! And the other, 'The Witchmaster's Secret' is a table top tale of the rescue of a witch condemned to a fiery death! Additional material includes: A poignant 'Titanic' story presentation for the Haunted Key. 'The Dead Eye' is a spooky story application for Doug Higley's Demented Eye. And 'The Mark of the Grim Reaper' is a simple to do card trick – based upon an old plot. Leslie explains in full detail the construction of Roy Johnson's 'Flawless' - a first class envelope switching system including an original presentation first marketed by the legendary Ken Brooke. 'Another, then Another and Another' – Leslie's popular Repeat Banknote Jap Box Production. Also, 'An Adventure with a Leaf' - A life changing experience using the Okito Rising Pencil principle. Not all is aimed at the Bizarrist – there are a number of items for the children's entertainer, including the very topical 'Litter' plus a discussion and NEW (?) presentation of the Magic Colouring Book. 'Magictales Two' contains 26 chapters and we are confident that there really is something for every performer. Again, this book has been published by Leaping Lizards Magic to the same high quality as his previous book Magictales. Leaping Lizards Magic are also offering both of these books in a single hardcover volume for those who want them both together in a collector's edition. To go to the Leaping Lizards Magic site page about this click HERE.